Sahara India Pariwar is a name that needs no introduction. Dubbed by the Time magazine as ‘the second largest employer in India after the Indian Railways’, Sahara India is one of India’s largest conglomerates. Furthermore, what adds to the group’s glorious history of more than four decades is the incredible journey of its founder, Subrata Roy Sahara. Fondly called ‘Saharasri’ by his workers, Subrata Roy Sahara was born on 10 June 1948 to Chhabi and Sudhir Chandra Roy in Araria, Bihar. The family later shifted to Gorakhpur, Uttar Pradesh, in search of better opportunities. Roy used to live in Turkmanpur area of the city along with his parents and siblings. As a child, Subrata Roy was a bright student. He held great interest in technical education, and he pursued this interest as he went on to earn a diploma in Mechanical Engineering from the Government Technical Institute, Gorakhpur. He initially wanted to take up a job, but had to drop the idea to support his family when his father passed away. Harsh circumstances that followed drove Roy to sell salted snacks (namkeen) in the streets of Gorakhpur on his Lambretta scooter during his early youth. He named his venture Jaya Products. The venture also marked Roy assuming the role of a guardian, a role that he still holds for his beloved Sahara India Pariwar. The Lambretta scooter from his early days now stands in a glass cubicle at the company’s headquarters Sahara Bhawan in Lucknow’s Aliganj area. For Sahara India workers, the scooter is a reminder of the humble beginnings of Saharasri, and a source of constant inspiration. The foundation of Sahara India was laid by Subrata Roy in 1978, when he opened a small office for his business of deposits and para-banking in Gorakhpur. The company, Sahara India Financial, started off with 42 depositors in a single establishment. Roy wanted to start something that would help common people shape their dreams into reality. Most of his first clients were the daily-wage workers who would invest 20 per cent of their daily wages with him, dreaming to make it big. Despite the enormous growth it has experienced over the last four decades, Sahara India still remains a “people’s company”. Sahara India Pariwar has achieved great success since its inception in 1978. Under the leadership of Subrata Roy, the group today is servicing 6.1 crore depositors through 1,707 establishments across the nation. The conglomerate holds a net worth of over $10 billion. Still, success has never got into the Sahara founder’s mind, as he still considers himself to be the ‘Chief Worker’ of the company instead of assuming fancy titles like ‘Managing Director’ or ‘Chairman’.
. Roy also contributed to the relief efforts in flood hit Uttarakhand in 2013. His philanthropic efforts indicate that Roy’s true wealth lies in the love that he receives from people. 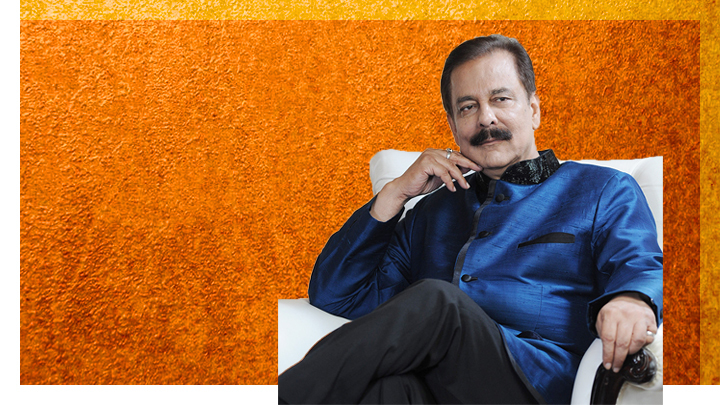 Sahara India founder Subrata Roy’s life story is an inspiration to all those entrepreneurs who are still at a nascent stage of setting up their ventures. Anyone can make it big; all you need is the right amount of hard work and immense persistence.